Eldoret, Kenya, December 2012. Length is about 4 mm. 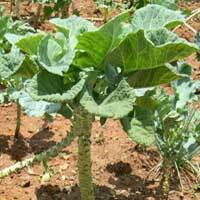 It was found on the lower leaf surface of Brassica oleraceae in a vegetable garden. The immature stages of Syrphidae live in a variety of habitats and have different feeding behaviors that depend on the species. There are many, many species (171 recorded for Kenya, De Meyer et al., 1997). Among the most commonly encountered hover flies belong to the genus Eupeodes. As adults they are seen often hovering near and alighting on flowers. The immature stage is small, slug-like, and generally green. The shade of green most often matches the color of the plant upon which they move where they move surprisingly fast and sure. A pair of sharp mandibles at the head skewers aphids and holds them fast as their contents are eaten out. The role of these voracious, predaceous flies in controlling pests ought to be appreciated. 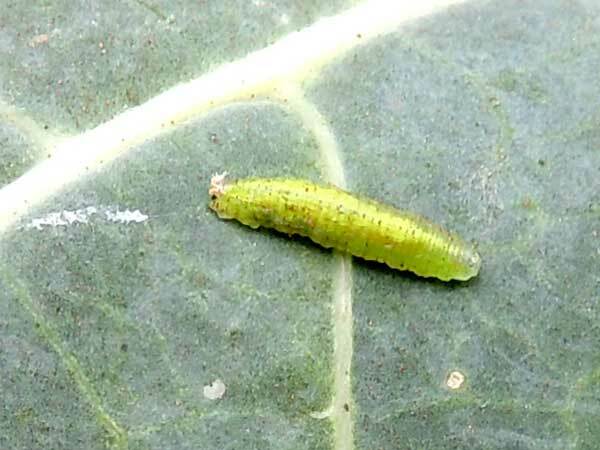 Treating aphid problems with pesticides should be avoided if these predators are present in good numbers. Zoogeography and Biodiversity of Syrpiddae (Diptera) in East Africa, Marc De Meyer, Edward Vanden Berghe, and Andy Whittington. (1997) Journal of East African Natural History 86: 43-50.